How to avail Paytm Dilwale cashback Offer? 2. Recharge for a minimum of Rs.500. Do bill payment, mobile recharge or DTH recharge. Get cashback up to Rs.100. Paytm Diwale Offer Code will be valid for both new users & old users but with different conditions. New users will get 20% cashback up to Rs.100. User will get 10% CB up to Rs.100. Paytm Dilwale Promo Code is valid only for one time per user. Paytm Dilwale coupon Code will be valid across all platforms. 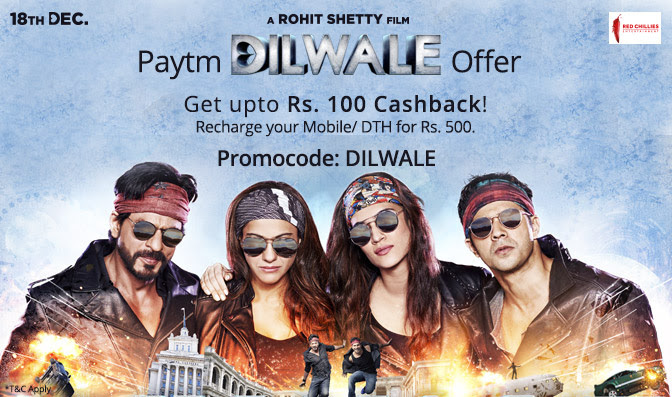 Paytm Dilwale Promo Code will be valid for DTH/Recharge/Bill-Payments. NOT VALID ON AIRTEL PREPAID USERS. Offer is valid till 18 December 2015.